The real enthusiast, the fanatical Wainwright completist, begins in the sea. He wades alongside the breakwater that emerges from the grey or sparkling waters beneath the heavy bluff of South Head at St Bees and then crunches his way across the shingle. He has another one hundred and ninety miles to walk through the finest country in England. If his feet weren’t already wet and cold, the next week or two of walking would be unalloyed pleasure. The Coast-to Coast Walk from St Bees to Robin Hood’s Bay is one of the greatest of long distance walks. Walking from one coast to the other across this narrow island seems such a simple and attractive idea, but it took the dogged genius of Alfred Wainwright to bring the path into existence. In the seventies he spent hours pouring over detailed OS maps to find a route that went from sea to shining sea and that was as little troubled by towns and metalled roads as possible. Even now, more than thirty years later, with the book in its third edition, minor revisions are needed on the route because of rights of way and conservation requirements. Wainwright’s original book fitted the walker’s pocket and, if its wasn’t already soaked with sea-water, offered a series of the famous maps and drawings that showed the eager pedestrian where to go and what to see. Derry Brabbs, under the guidance of the master, walked and photographed the moody route in the eighties, and now he has revisited many scenes and taken the photographs afresh. The landscape seems eternal. The dragonish cloud that lurks over Fairfield may well have been threatening thirty years before. The wintry sheep on the shores of Grasmere have barely moved and Striding Edge seems as sharp as ever. The dry-stone walls dissect the autumnal fields below St Sunday Crag and a single white sail seems to be still on Ullswater. His camera lingers on the wide panoramas of hills and lakes. Buttermere and Crummock Water stretch northwards from the tangled rocks of Haystacks. Ennerdale lies purple and sullen beneath a lowering sky or turns a murky orange beneath the setting sun. Fleetwith Pike viewed from High Crag is blackened by cloud, but the distant skyline is outlined in brilliant snow. Amazingly the motorway fringed with yellow gorse that normally noisily flows beneath the footbridge, is empty of cars. So too is the Roman road whose route can still be seen as it crosses Ravensworth Fell. One place that has changed is Innominate Tarn. Thirty years ago, it was the favourite resting place of Wainwright’s imagination. “Haystacks’ finest jewel,” he wrote, “is Innominate Tarn, a small shallow sheet of water in which flourishes the lovely bog bean and over which Great Gable and Pillar stand guard in ceaseless watch. A lonely spot of haunting charm. If I were destined to drop dead on the fells, this is the place I would like it to happen.” The waters of the tarn appear as they always have, gently ruffled by the passing breeze, but today Wainwright’s spirit rests there, his ashes scattered along its quiet shores. The journey for the tired pedestrian ends with the red roofs of Robin Hood’s Bay. This is a very welcome new edition of a special book. 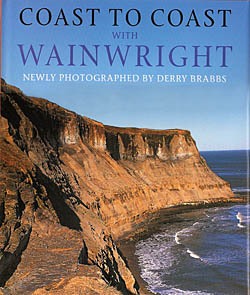 It offers a journey in words and pictures that should prompt many to put on their walking boots and crunch the shingle beneath the towering cliffs of St Bees.